Grizzly bear watching from our lodge in Knight Inlet starts in late May. At this time of the season the mother grizzlies bring their cubs, born in the den between January and March, to the beach for the first time. The three or four month cubs are very timid the first time they see a boat but when the mother ignores the “clicking cameras” so do the cubs but they are still alert to our presence. 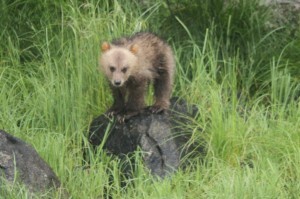 If the size of a dog pup’s feet is an indication of its eventual size then this cub will develop into a good-sized bear.